Bringing world-class skills to the lesson room, David Jumper has trained students to become all-collegiate, all-state, award winning musicians. David Jumper offers personal instruction for all instruments at the beginner level and specialty instruction for advanced brass players. 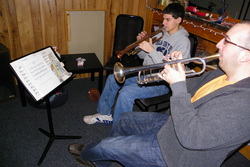 Instruction includes all playing styles, techniques and genres, with specialty instruction in jazz and improvisation. Jumper can teach you how to develop the good playing habits of the world's best performers.